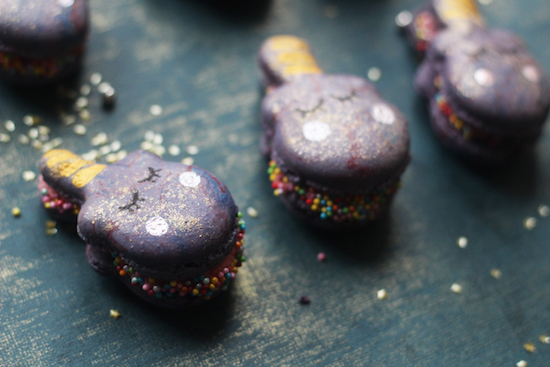 Emily's Recipes and Reviews | UK Food Blog | Leicestershire : unicorn macarons. The magical, mystical world of unicorn recipes! If you haven't seen a rainbow coloured, sprinkle stuffed, glittery recipe in the last few months then what have you been doing? 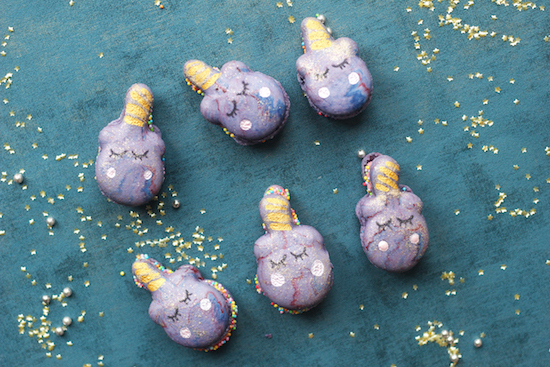 For a mythical creature, the unicorn is anything but invisible right now and I just had to get involved with this fun new trend in the form of unicorn macarons. Because when did rainbows and sugar and sprinkles not manage to make someone smile? I made these for one of my bestie's birthday parties - with a lovely lemon buttercream filling, a marbled macaron effect and of course a sprinkle of glitter! ♥ All of the rainbow sparkles! Step one. Make your macarons according to the below macaron step by step guide. When the food colouring part comes in, just keep it random with a marble effect created by cocktail sticks. Don't over mix it as you want the colours to still swirl through the mix. As you can see the mix started to turn purple as the pink and blue mixed, but it could look really good if you leave it plain white until the last moments for just a tiny bit of pastel colour. Step three. 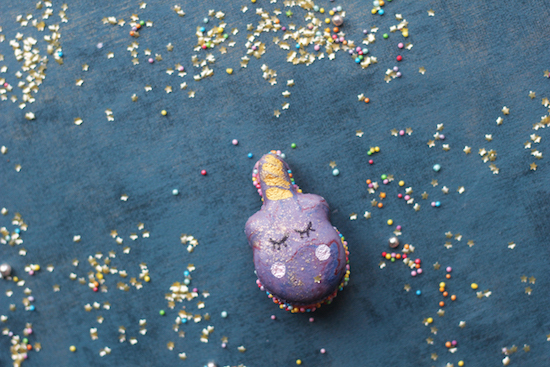 If you fancy, scatter the horn with edible glitter before baking (and before the setting time). This was an experiment but I was pleased with the results. Step four. Bake for 10-15 minutes as in my macaron guide, whilst you whisk together all the lemon buttercream ingredients until fluffy. Set aside. Wait for the macarons to cool before removing from the mat. Step five. Draw eyes and eyelashes on half the macarons - this is easier to do before they have a filling as you may need to press down a little. Step six. Pipe the lemon buttercream filling and gentle bring the halves together. Don't do the "twist" technique from the diagram as you want the ears and horn to align. Dip the edges in rainbow sprinkles, allowing them to coat the buttercream. Now for the exciting part! 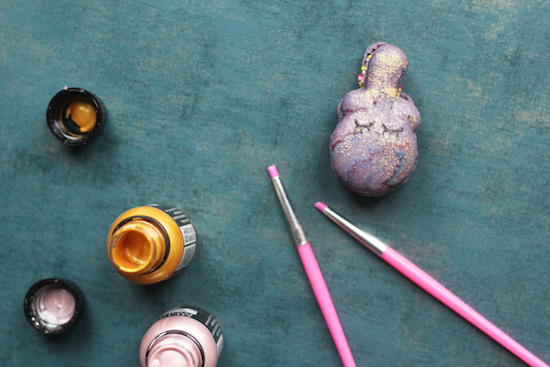 Channel your inner unicorn with metallic decorations. I decided to paint the horn in gold and add some cute rosy cheeks. And as if by magic... Ta daaaa! Have you ever made any unicorn inspired recipes? What macaron recipe shall I try next? 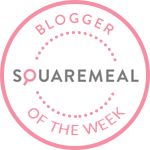 Check out my other macaron blog posts - including everything from cheeseburgers to Maltesers! What a nice article! You’ve shared very useful information. You really did an awesome job. Thank you so much. You make the whole process look so easy.